About this time last summer, two federal investigations into the smuggling of Cuban baseball players to the United States were gathering momentum. Most Cuban defectors on Major League Baseball rosters, and many in the minor leagues, faced interviews by investigators from the Department of Homeland Security or the Federal Bureau of Investigation. Many players who refused to talk received court-ordered subpoenas. Photographs of smugglers were shown, questions were asked, and documents were obtained. Rumors among players even began to circulate about who had snitched on whom. The dual investigations, dubbed by agents as Operation Safety Squeeze and Operation Boys of Summer, initially targeted smugglers as well as the financiers and handlers who aided smuggling rings at the grass-roots level. But investigators also were examining something larger, multiple people familiar with the investigations have told Outside the Lines: whether MLB team officials and some at the league office had willfully ignored criminal activity that had helped teams sign Cuban players. In addition, agents were investigating whether employees of MLB clubs may have financed smuggling operations or paid smugglers for the opportunity to sign highly prized players. Investigators twice presented subpoenas to the MLB commissioner's office in Manhattan, one as recently as last summer, seeking internal communications and other documents about contract negotiations between MLB clubs and Cuban defectors. The heightened activity seemed to portend a day of reckoning. MLB officials and lawyers even flew from New York to Miami in March to meet with the U.S. attorneys supervising the case and "find out what was going on," according to a source familiar with the trip. But people with knowledge of the federal probes have told Outside the Lines that the MLB piece of the investigation has slowed, as federal agents have struggled to convince officials at the U.S. Attorneys Office in Miami that enough evidence exists to move forward. The U.S. Attorneys Office declined to comment. And for their part, federal law enforcement authorities declined to go into details with Outside the Lines about the investigation and refused to identify teams, club employees or commissioner's office officials who might have been interviewed or subpoenaed. Major League Baseball's chief legal officer, Dan Halem, said in a statement that the league office itself is not under investigation: "MLB has been informed by federal law enforcement authorities that neither it nor its personnel are the focus of any criminal inquiry. MLB has consistently cooperated -- and will continue to cooperate -- with the appropriate government authorities to protect our Cuban players from the dangers posed by human smugglers." In prior public comments on the issue, officials from Major League Baseball and its franchises have argued that they are passive recipients of Cuban talent, innocent bystanders disconnected from the sophisticated human smuggling operations that bring the players to MLB's doorstep. In the past two years, the Los Angeles Dodgers, Chicago White Sox, Arizona Diamondbacks and Boston Red Sox have signed players who defected from Cuba to contracts worth more than $30 million each. Halem told the Los Angeles Times last year: "We almost never hear of how the players got here." Still, as early as 2009, internal MLB communication obtained by Outside the Lines described an "organized mafia" that had developed around the black-market business of extracting and trading Cuban baseball players. But several people familiar with the investigations told Outside the Lines that MLB officials did not aggressively try to learn more, stood down on lines of inquiry regarding residency-status fraud, and didn't consistently share information with federal authorities. The most ambitious and most talented Cuban ballplayers have, in recent years, come to rely on a clandestine group of operatives -- most of them Cuban émigrés based in Miami; Cancun, Mexico; and the Dominican Republic -- to move them across borders and get them in front of MLB scouts. But these aren't just high-end coyotes. According to federal law enforcement officials, violent elements within the rings -- some affiliated with the ultraviolent drug cartel Los Zetas -- have carried out murder, armed robberies, home invasions, kidnap-for-ransom plots, and trafficked in nonathlete Cuban migrants, whom they sometimes have beaten and threatened with death if their relatives didn't immediately pay up. Whenever a major league club signs a Cuban player, the smugglers take a 20 percent to 30 percent cut of the contract, according to documents from prior smuggling-related court cases and interviews with people involved in the underground smuggling networks. Money flows from a team to the newly signed Cuban player to his smugglers, whom the player pays in much the same way as his agent -- though following the smugglers' instructions. Yasiel Puig's arrival to the Los Angeles Dodgers involved many of the classic smuggling elements, including contact between MLB personnel and at least one handler who was later indicted on smuggling charges. The Puig saga also provides an example of MLB money flowing from a team to a player to people with alleged ties to a violent smuggling operation. Gilberto Suarez, who played a major role in Puig's Cuba-to-Mexico-to-Dodgers adventure and pleaded guilty in December to helping smuggle Puig into the United States, told Outside the Lines that he'd known two Dodgers scouts, Mike Brito and Logan White, "by sight" from two years he had spent in the Dominican Republic. 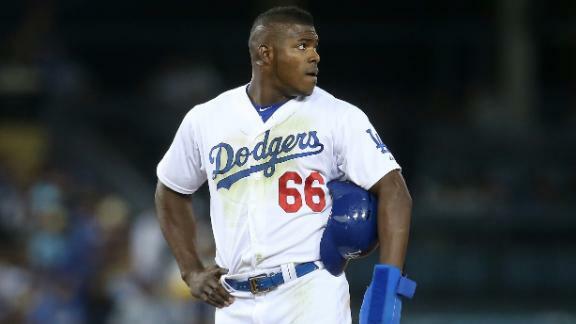 Although a sports agent named Jaime Torres was Puig's official representation, Suarez, who is not an MLBPA-certified agent, said that Torres played only a supporting role in the Puig-to-Dodgers deal. Suarez, according to a former business partner and other people familiar with his case, ran a small Cuban ballplayer smuggling outfit out of Miami. Suarez denies any ties to smuggling or crime rings, but in an interview he said he alone negotiated Puig's contract with White and Brito, describing in great detail a marathon back-and-forth session that took place at a Mexico City hotel as he tried to extract as much money as he could from the Dodgers on Puig's behalf. Once the deal was struck -- for $42 million, at the time a record for a Cuban -- a contract was faxed from Los Angeles to Mexico City, Suarez said. Puig signed the paperwork, and, with Suarez sitting beside him, held it up and posed for a camera, a photograph that would ultimately be presented to the judge when Suarez was being sentenced on a federal charge related to the Puig deal. The contract was then faxed to Torres for his signature, Suarez said. Torres partly disputes that version of events. He told Outside the Lines this week: "I'm the one who negotiated that contract." But, he added, Suarez did play "a major part of communicating to the Dodgers what Puig would accept ... Do I give Gilberto Suarez credit for communicating Puig's interest in the Dodgers and seeing to it that we got a certain amount? Yes. But I disagree that he alone negotiated the contract." Asked about the circumstances surrounding the Puig signing, White, now a senior adviser to the general manager and pro scouting director for the San Diego Padres, told Outside the Lines: "I'm not really at liberty to speak about it." He cited an email he'd previously received from the Dodgers' front office instructing him and others in the organization to refrain from discussing the smuggling issue publicly because of an ongoing federal investigation. A Dodgers spokesman declined to make anyone within the club available for an interview. Brito said this week that there were "three or four guys" with Puig in Mexico City, but he did not know their identities, and that, as a talent evaluator, he had no role in negotiating player contracts. Suarez also said that the Puig deal was not the first he'd negotiated with MLB team representatives. Suarez said he worked in 2012 with Chicago Cubs player-development executive Oneri Fleita on a $6 million contract for pitcher Gerardo Concepcion. Now a scout with the Tampa Bay Rays, Fleita acknowledged to Outside the Lines that he had once met with Suarez and that they had discussed Concepcion and a potential contract. Suarez "might have insinuated some numbers," Fleita said, and he recalled there being some back-and-forth, but he said the real deal was done in Chicago between the Cubs and Concepcion's certified agent, Jaime Torres -- the same Jaime Torres who represented Puig. Fleita said it was his practice not to ask too many questions about Cuban players: "I figured it was none of my business. And I don't really want to know." One former Major League Baseball executive, who spoke only on the condition of anonymity, told Outside the Lines, "If I'm running a club, I don't care how the guy got to the D.R. or wherever. As long as my own people aren't involved in the smuggling, why would I care?" But there is real danger for anyone involved in the smuggling. Numerous Cuban ballplayers who have been smuggled have told the media, the MLB Players Association and investigators of being held hostage in Cancun until someone paid for their release. One former minor leaguer says he witnessed a murder while being held in a Cancun safe house by his smugglers. Others have experienced shootouts during botched attempts by one smuggling ring to steal the players from another. In 2009, an internal MLB memo obtained by Outside the Lines and written by Ronaldo Peralta, then the head of MLB's office in the Dominican Republic, warned of a "dangerous pattern" involving Cuban ballplayers seeking big league contracts in the Dominican Republic, and that an "organized mafia" was "smuggling people across international borders with false documents." The memo also suggested that these smuggling operations were bribing Dominican immigration officials in exchange for granting quick permanent residencies to players -- status that would make them MLB free agents, and thus enable them to sign more-lucrative contracts. The memo, which Peralta had addressed to a member of the MLB's Department of Investigations, prompted an inquiry by the league's investigative unit. In an interview with the unit's investigators in 2009, a New York Yankees signee described a now-familiar plot line: He was extracted from Cuba on a boat by a group of smugglers, brought to Cancun and held there while the smugglers arranged for his sale to another group based in the Dominican Republic. The Mexican group, the player said, also trafficked in drugs, guns and regular Cuban migrants. The DOI turned this information over to the American embassy in the Dominican Republic. According to people familiar with the federal investigations, DOI personnel also found evidence of rampant fraud involving Cuban defectors: Their handlers within the smuggling rings were bribing immigration officials in Mexico, the Dominican Republic and Haiti for permanent residency status, a crucial piece of documentation for Cuban ballplayers seeking to sign with MLB teams. Because of the trade embargo with Cuba, American companies can't hire Cuban nationals unless those Cubans can show that they've left Cuba for good. One way to do that, per the embargo regulations, is to obtain permanent residency status in a country other than Cuba, a multistep process that typically takes years, no matter the country. Some Cuban ballplayers were becoming permanent residents in third countries within a matter of days. As was standard operating procedure, the DOI's investigators reported what they had found to MLB executives, concerned that MLB's own policies -- which allow Cuban defectors to become free agents, but only if they first gain residency in a country other than the U.S. -- were enabling corruption, according to sources familiar with the federal investigation. However, those sources said, MLB executives believed that the validity of a person's permanent-residency status in such cases had already been cleared by federal government agencies; as a result, investigators stood down on looking into the matter further. MLB's chief legal counsel, Dan Halem, in a statement this week, said: "MLB has never informed any of its investigators not to investigate allegations of criminal activity surrounding the process by which Cuban players have left the country. To the contrary, MLB has worked closely with law enforcement on this issue over the years." The leader of MLB's investigative unit from 2008 to 2014 was Daniel Mullin, who, along with several colleagues, was fired by the league last year over concerns the unit had at times used unethical and overly aggressive tactics while investigating performance-enhancing drug and gambling cases. Mullin told Outside the Lines he signed a confidentiality agreement with MLB upon his departure that prevents him from discussing his time with the league. In 2011, federal law enforcement agencies began examining smuggling rings in the context of baseball, according to a person with knowledge of the probe. Special agents in the Miami field offices of Homeland Security Investigations and the FBI ultimately teamed up to run the dual probes, supervised by the U.S. Attorneys Office in the Southern District of Florida. A handful of indictments and guilty pleas have so far resulted. The headliners have been Suarez, aka El Rubio, "The Blonde," and a smuggling kingpin named Eliezer Lazo, aka El Chicharo, "The Chickpea." Lazo's group had been in operation since at least 2009, according to court documents and media reports, allegedly smuggling at least a dozen players out of Cuba, including Texas Rangers outfielder Leonys Martin and Miami Marlins shortstop Adeiny Hechavarria. Court documents suggest that Lazo's group had an ongoing relationship with a Miami-based sports agent named Bart Hernandez, well known in the industry for representing Cuban baseball players. Federal investigators have searched Hernandez's house. Hernandez did not respond to requests for comment. People close to the broad smuggling investigations say federal agents were and still are chiefly focused on taking down the violent elements within the smuggling networks. As time went on and the probe evolved, federal agents also became interested in potential links between major league teams and the smuggling rings. Agents began scrutinizing "all the potential beneficiaries," a person close to the investigation told Outside the Lines. A source told Outside the Lines that the dual investigations remain open and ongoing despite the absence of higher-profile developments since last summer. But the probes face significant obstacles, including a dramatic foreign policy breakthrough between the United States and Cuba over the past eight months. Moreover, bringing criminal cases against smugglers and their associates can be extremely complicated. The league finds itself in an extraordinarily delicate position. Even as the Miami-based federal investigation unfolds, MLB and its Washington lobbyists are, in the wake of the détente, trying to work with the White House to create what would amount to an exception to the trade embargo. The ideal would be for Cuban baseball players who wish to play professionally in the United States to remain citizens of their native land and travel back and forth as they please. MLB commissioner Rob Manfred, late last month, called it a "more regularized process for Cuban players to come to the United States." According to U.S. Department of Justice sources, the act of smuggling a player out of Cuba and into a country other than the U.S. -- even if financed and orchestrated from U.S. soil -- is likely in itself not a U.S. crime. (However, if someone arranged to transport that player into the U.S. without a visa and the motivation was profit, that would be a crime.) To pay for expedited permanent residency status in a third country may well be bribery, but that might be difficult to prove without getting immigration officials in foreign countries to confess to taking the bribes. And once smuggled Cuban ballplayers eventually do enter the United States, it's usually on a legally granted U.S. work visa sponsored for them by their MLB clubs. Ben Daniel, a former federal prosecutor in Miami, is responsible for the first successful prosecution of a Cuban ballplayer smuggling conspiracy in 2007. In that case, the smugglers snuck undocumented Cuban players directly into the United States, a primitive strategy compared with what goes on now, according to Daniel. "It looks like the crooks have outsmarted the authorities," he said. "They've learned their lesson. They've come up with a scheme to beat the smuggling laws of the United States." When Lazo pleaded guilty last year, it wasn't on charges of smuggling baseball players. He was charged in the extortion of regular, nonathlete Cuban migrants. As for Suarez in the Puig case, the government didn't charge him with full-blown alien smuggling. Instead, it was something more limited: the conspiracy to "encourage and induce an alien" to enter the United States illegally. He was sentenced to a month in prison and five months of house arrest.